One of Tokyo's black markets during post World War II, Ameya-Yokocho (飴家横丁) Market has since legitimized and instead of contraband it now sells fish, shoes, watches, snacks and other delights. It is also known as the Candy Market but that is misleading as there is very little candy to find in present day. But if you had come to the market Pre-WW II you'd be as happy as a kid in a candy store. Strolling down the narrow paving stone alley, you’ll hear boastful vendors shout into the crowd. 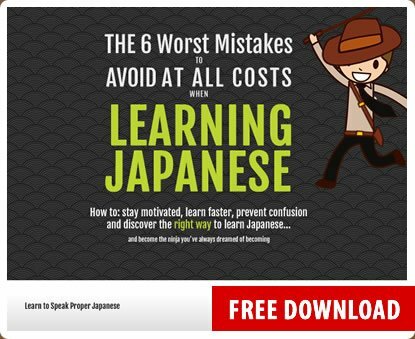 Phrases like: "meccha umai!" (very delicious) "zehi, zehi!" (come, come!) 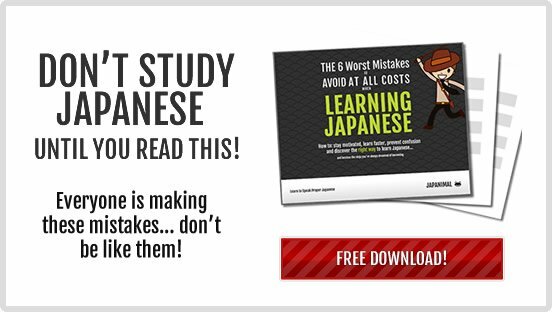 and "douzo" (after you, go ahead). The market is certainly lively, something which cannot be said for other parts of Tokyo. 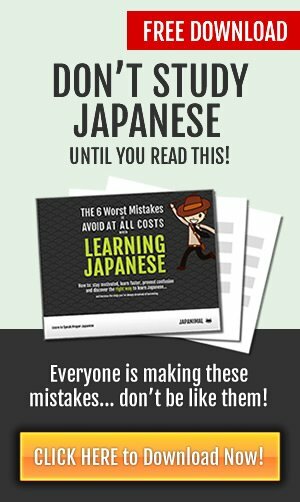 You'll even encounter some non-Japanese vendors yelling out their specials in Japanese and English. 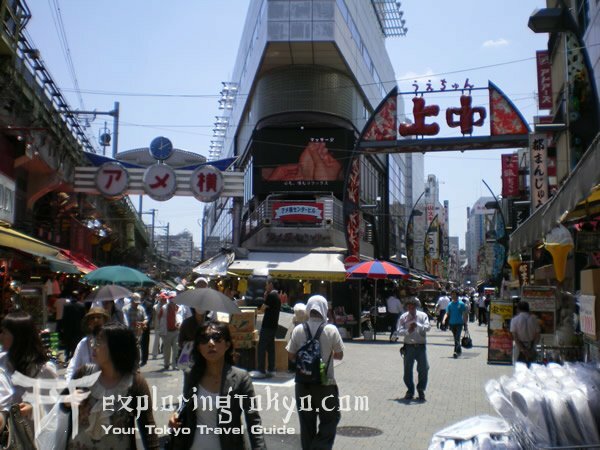 The market consists of two main streets or alleys, both of them running parallel to the JR train line, the first street closest to the train is solely street vendors and is the core of the market whereas the next street are mostly permanent shops and more upscale shopping. While the market does have a great diversity in shops, you will find the majority are either clothing (as in shoes, hats, shirts and accessories) or fish. 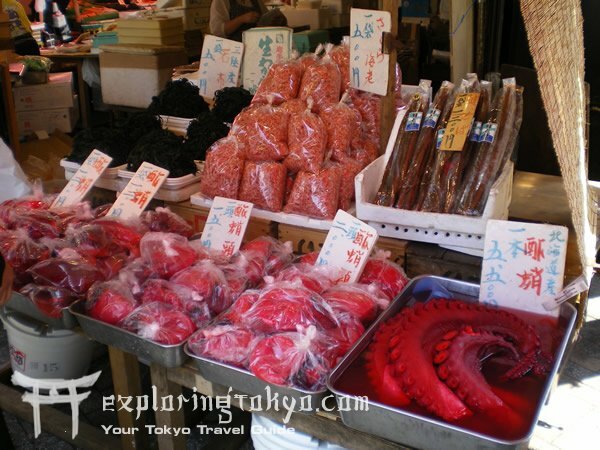 Be prepared to find some surprising sea food; whole octopuses soaking in their own blood, trays of giant octopus tentacles, ice boxes of dozens of different fish, straight out of the Bay, sea worms, mollusks, and much much more. As a consequence to the preponderance of sea food there is a strong scent of fish in the air. Aside from Fish and snacks there are also fresh fruit stands. 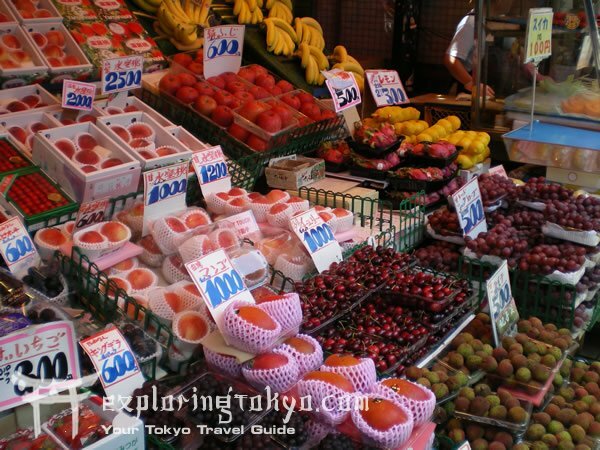 Fruit is a luxury in Japan, as indicated by the prices. For example a large watermelon in the U.S. which would go around $4.00 would cost a whopping and mind-boggling $35.00 in Tokyo. In Ameya Yokocho the prices aren't horrible but they're certainly not cheap. Expect to spend $6 for four apples, or $5 for a bunch of grapes. 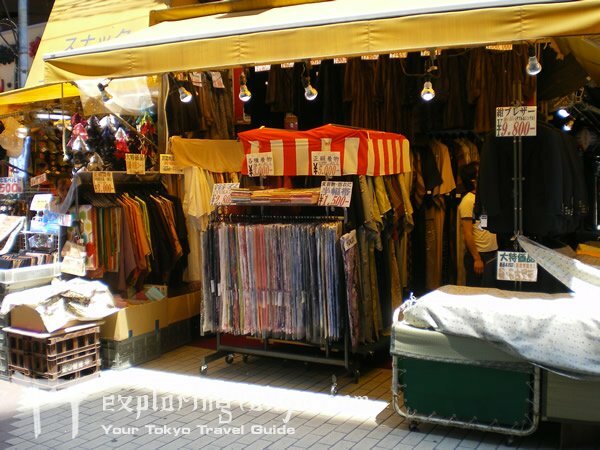 One of the more exciting types of shops in Ameya Yokocho are the Traditional Japanese Clothing stores. Kimono, Yukata, Hakama, Geta, Samue and more. Prices are surprisingly affordable. A Samue set for $40 or Yukata for $50. The market is conveniently located behind the towering Yodobashii Camera building, which is directly across the street from the Ueno Park main entrance. 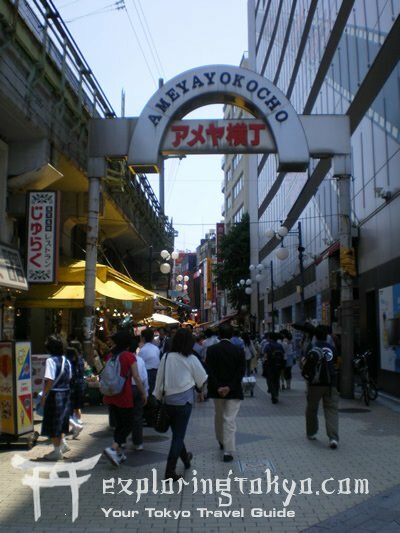 Take the JR Yamanote line to Ueno Station, and take the exit for Ueno Park, once you approach the entrance to Ueno Park you'll see across the street the Yodobashii Camera building, just head over that way, and walk around back, then behold the Ameya Yokocho market.